For many people watermelon is a summer fun food. Recent research now seems to indicate that this delicious fruit may also be an important tool in lowering high blood pressure. Native to central Africa this fruit arrived in the Americas in the early 1600’s and has grown in popularity ever since. According to The University of Georgia approximately 100 million are now grown annually in America. Help to Lower Your Blood Pressure? Salt or sodium is a mineral that most doctors will ask you to reduce to help you control your blood pressure. This piece of advice has long been debated in the medical community. According to the Journal of the American Medical Association, reducing sodium intake has a limited effect in lowering high blood pressure and a minimal effect on people with normal blood pressure. However, recent research in the United States is finding out that a moderate sodium intake combined with a higher intake of potassium, calcium and magnesium, minerals that are found in fruits, vegetables and low-fat dairy products, offers more significant benefits for reducing high blood pressure than just restricting sodium intake. These four minerals, sodium, potassium, calcium and magnesium work together to regulate blood pressure. And now, researchers from USDA Agricultural Research Service, Texas A&M University, University of Nevada, and Oklahoma State University, have reported that the levels of arginine in the blood increased by 22 percent after three weeks of drinking watermelon juice with every meal. Arginine is a substance needed to produce nitric oxide, which has been shown to lower blood pressure, reduce blood clotting and protect against myocardial infarction and strokes. 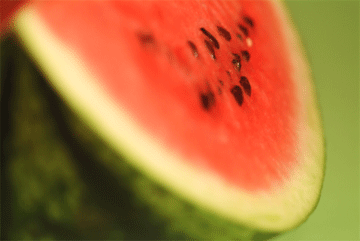 The study included 23 volunteers who received 1560 grams of watermelon juice per day. Julie Collins, the lead author of the study, reports that the volunteers showed that fasting blood levels of arginine had increased by 22 percent in three weeks. “Because the watermelon juice study was not continued longer than three weeks, it is not known if arginine levels will have remained stable at three weeks or if there would have been further increases with prolonged administration,” stated the researchers. Your body will convert citrulline into the amino acid arginine. As stated earlier, arginine is the precursor for nitric oxide. Nitric oxide is the signaling molecule that helps to regulate the cardiovascular system. Isn’t it interesting that nitric oxide, which is an environmental pollutant outside the body, is the most important signaling molecule when inside the body! It is crucial in helping to regulate your blood pressure. The name of this fruit, watermelon, gives us a clear idea of what it is made of. Of all fruits, it contains the largest percentage of water, 93%. In fact, two large slices are equivalent to one glass of water. Its refreshing and moisturizing qualities, along with its low contribution of energy – barely 20 calories in 100 grams – make watermelon, without a doubt, the queen of fruits during summer time. Watermelons are excellent diuretics: they stimulate kidney activity and increase the production of urine which favors the elimination of toxins. It is low in fiber and its fat content is almost non existent. Noteworthy is its content of the carotenoids lutein and lycopene. Lycopene, the responsible pigment for the red color in certain fruits, has antioxidant properties that help reduce the risk of cardiovascular disease. As you can see from this list and what we talked about early, watermelon helps lower blood pressure, has antioxidant properties, fights infection, helps your body heal faster, can aid in weight management, and is a comfort food that can sooth stress. Now it’s just a matter of picking a ripe melon. Watermelons that are grown in the open mature between the end of spring and the beginning of summer, reaching their peak during summer time. To know if it is just ripe, “knock” on the peel; if it sounds hollow it means the fruit is full of water, ripe, and ready for the whole family to enjoy its sweet flavor. Buy pieces that their peal is not damaged with bruises or dents. If you buy a whole watermelon you can keep it outside the refrigerator for about two weeks since its thick peal protects the inside fruit. But once you start it, keep it in the refrigerator, well wrapped so that it does not lose its water content.